That to the left is a picture of the stairs leading up to the media room at the Sporting Club where the European Poker Tour Grand Final Main Event is taking place here in Monaco. There are 20 steps. Every time we get something on the tournament floor in the main tournament room, we have about a two-minute walk back to share what we’ve learned with the rest of the world, and this climb represents the last part of that journey. During the first minute-and-a-half of the walk, your humble scribbler is usually thinking back over the hand or hands just seen, doing a mental shorthand of the report I’m about to transcribe from the literal scribbles written down in the notebook I’m carrying. But by the last part of the walk -- by the time I reach these stairs -- such thoughts tend to vanish. Sometimes they are replaced by a rapid inventory of aches and pains, an inevitable byproduct of a week-and-a-half of constant movement. Mostly it’s the ankles and knees demanding to be noticed, but other muscles and joints occasionally cry out as well along with the squeaks of the wooden steps. Monaco is all about walking, and often climbing. Everyone seems to face these flights of stairs, no matter where they’re heading within the principality. I think during my visit here last year the metaphor of Grand Prix racing was foremost in my mind, probably because I was walking in everyday from a hotel located about a half-hour south (by foot) of the Sporting Club. But this time it is the staircase. And indeed, what I’ve discovered is how during that last part of the walk back to my laptop, I keep going back to the symbolic value of the stairs I climb. No matter what they’re doing here, everyone at the festival -- players, media, staff -- looks at it as a kind of challenge that necessarily requires multiple steps to be completed. Whether it’s trying to survive the levels and days of a tournament without being eliminated, or simply to get through each hour and each day accomplishing whatever job they do. And of course everyone wants to do well and succeed, however that is defined, there are steps to climb before the thought becomes action, the plan becomes realized. Gonna go rest up so as to be able to rise and climb some more tomorrow. 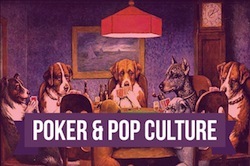 Check over at the PokerStars blog to see what we all are carrying back up to the media room each of those trips to share.